It’s taken nearly a week, but I finally feel like we’ve decorated. Usually the first Sunday in December is decorating day for us and although we started on Sunday, it took me all week just to get to this point, and I’m even keeping it simple this year. It’s hard to tell in this shot, but notice the lack of decorations on the tree? I have a ton of beautiful ornaments. 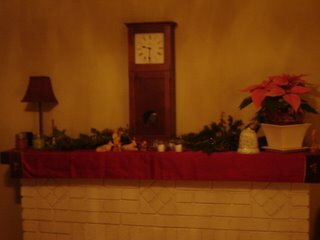 Many are antiques and others are lovely ones from Europe that my MIL buys for me every year. So far we’ve never had trouble with Little Man and the tree. We put the kid safe ones on the bottom, the nice ones on top, and he took it very seriously. This year, however, he is way too curious. He already knocked the tree over Sunday when we were putting the lights on, and he’s discovered that if he pulls it by the branches on the bottom it will slide across the floor. Cool, huh? He knows this is bad news but it is just too irresistable and he does it at least once a day, until I kindly remind him that’s probably not a good idea. Then he forgets all about it and does it again the next day. So for now, the kid friendly ornaments are the only ones on the tree and I’ve got another 50 or so in the basement, just waiting. 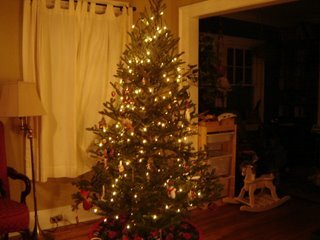 We’ve got a deal that everyday that goes by without ornament removal or tree-sliding (seriously, who can resist that?) we’ll put a few of the nice ones on. Knittybaby, amazingly, has only tasted the tree once or twice and otherwise leaves it alone. I love my nativity. It is hand carved out of olive wood from a Palestinian family; I bought it at my church’s alternative gift fair a few years ago. I rarely spend a lot of money on items like this for the house, but it was too beautiful to pass up. At my friend Rebecca’s suggestion (is your blog up yet?) we are doing a progressive nativity. Rather than set the whole thing up at once we are trying to spread it out all the way through Epiphany, telling the story as we go. Little Man is not quite getting the concept however and he keeps moving them around and changing the story, quite creatively I might add. Right now Mary is hiding behind the pointsetta “because she likes it there” and Joseph is on the kitchen table, mostly because Little Man is just plain confused about what his whole role in the story is anyway, no matter how I explain it. I’m hoping Sunday school will help clear things up this weekend. There are way too many whys right now and he’s not happy with my answers. So consider this a meme of sorts. What does your holiday decorating look like? I think Little Man is beyond his years in the understanding mode…as I recall, Joseph was also a bit confused at the time. It’s beginning to look a lot like christmas. I love your nativity too. Wish I had one. One of these years. We have a tree, its decorated but thats as far as it got! The weather is suppose to be in the 50’s tomorrow so maybe outdoor lights? 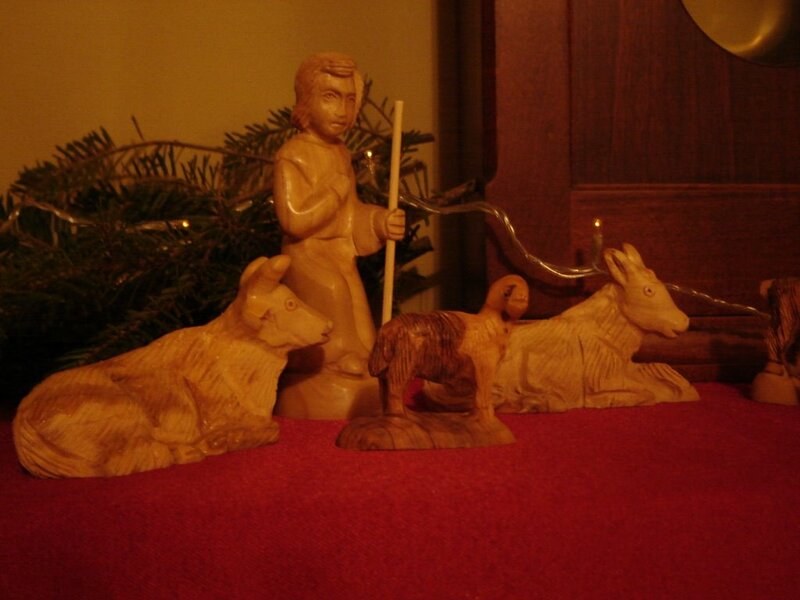 Oh, I have some nativity’s set up and I,too, have one carved from olive wood from Israel, but mine is very crudely carved,like a little kid did it.But a good friend brought it to me from her trip there so I like it. I’ve already posted a lot about my decorating – the village and the tree are up. I’ve always been relatively lucky with kids and pets as far as the tree goes. I usually tip the tree over every third year or so. A beautiful nativity set – they are true artisans! Love your decorating, I gave up on putting my really good ornaments on the tree a couple of years ago. I now let the kids decorate it.